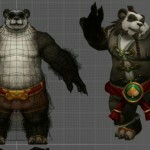 Here’s an interesting video with some info about new character models and when they could be coming to WoW, item squish, and a few other WoW related things. . It seems like the Dwarf will be the first new model…. >_> why dwarf??? In my opinion they should have started with humans or orcs. Also, why are they so slow? They are only 25% done now… Seriously, with they amount of money they make from subs you’d think they could get one or two guys to just work on the new models. What do you guys think about the character models? She also gives a few tips for starting out in PvP if you don’t know what to do.